Mannojo Nomura, who was a Kyogen performer and also an artist of the composite art had revived the Japanese performing arts called the “Daidengaku”. Unfortunately, Mannojo passed away at an early age due to illness in 2004. His father Man Nomura, who is a famous Kyogen performer of the Izumi School continue his son’s legacy by promoting the cultural exchange and community revitalization with public participation all over Japan. 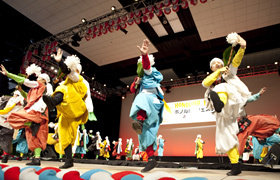 Also the reputation of the Daidengaku has been spreading across the world which Man Nomura gained assistance from the Agency for Cultural Affair to perform in the 15th Annual Honolulu Festival. The basis of the Daidengaku is the Japanese performing arts called the “Dengaku” which was extremely popular during the era of Feudal Japan around 1000-1600. Originally, the Dengaku was performed as a work song and dance for the people during rice plantation. Later it was developed as a ritual to worship gods and pray for rich harvest. Also, it was favored by the nobles, warriors and many during the Kamakura and Muromachi period. Afterwards, the Dengaku disappeared from the scene which may call it the “lost performing arts”. Moreover, Mannojo created a contemporary version of the Dengaku with the cooperation of the folklorists and Japanese literature scholars by adopting various traditional arts, rhythmical music and dances which also involves western elements. Also, he incorporated a few remaining documents of the Japanese literature and historical picture scrolls. 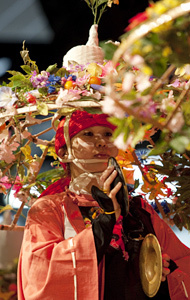 In addition, a colorful costume was adopted to modernize the traditional arts. The Tenshu Monogatari is a Reader’s Theater by Keiko Matsuzaka, who is a Japanese actress that contributes her life into this play. This is a mysteriously beautiful love story between the evil princess that lives in a castle tower and a young human warrior. The original was written by Kyoka Izumi, who was active as author of novel during the late Meji Period through the early Showa Period. In addition, it is known to be the best work in his career. Moreover, Mannojo met Keiko through the NHK TV show in 2001. At that time he was the cultural editor of the show. Afterwards they staged the Tenshu Monogatari in Noh Style. 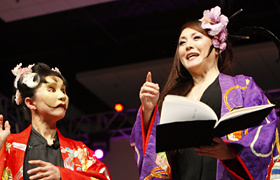 In addition, Keiko began appearing in the performance of the Daidengaku after the death of Mannojo. 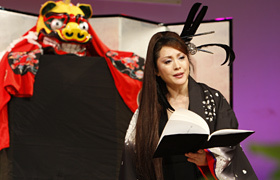 Keiko Matsuzaka performs the reader’s theater Tenshu Monogatari. 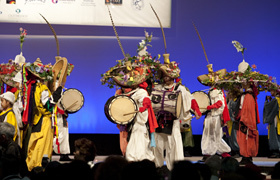 Wearing a mask is one of the expressions in the Japanese performing arts. 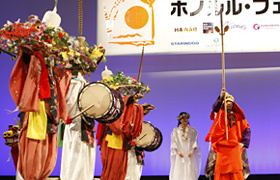 The dancing performance of the Daidengaku is mystical yet thriving with dynamism. Man Nomura was watching the performance with other audience. 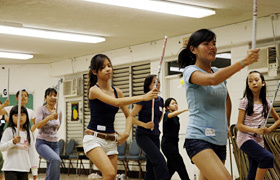 The members of the Daidengaku dancers in Honolulu started practicing a few days before the 15th Annual Honolulu Festival. 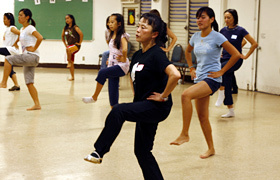 Kaori Sugahara and Kumi Akasaka were the instructors that came from Japan to support the local dancers. The dancing members included a wide range of age groups from 7 to 60’s. 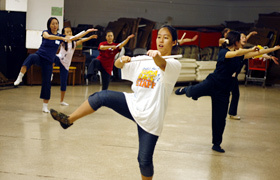 The dance incorporated Hawaiian elements such as shouting the name Kamehameha, who was the King of Hawaii. Also, the members were planning to include the official Hawaii state fish called “humuhumunukunukuapua’a” in their performance. In addition, Sugahara added new ideas during the practice session and the members have practiced over and over again. They practiced diligently in a limited time which they gave advice to one another even during their break. Furthermore, everybody had gathered for the practice session including the actress Keiko Matsuzaka who also performs in the Tenshu Monogatari. 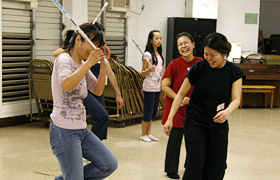 Everybody practiced in such a harmonious atmosphere as if it’s not their first time. Also, they were united as one in hoping for their successful performance. Each face looked serious during their repeated exercise. Sugahara’s vigorous voice echoed during the practice session. The members were practicing during their break as well but they looked like they were having fun. Gradually they were able to dance in unison. 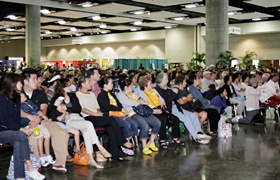 There were a lot of audience that were anticipated to watch the performances on Saturday, March 14 at the Festival Stage located inside the Hawaii Convention Center. The light sound of the traditional Japanese bamboo flute resonated as the presenter introduced Tenshu Monogatari. 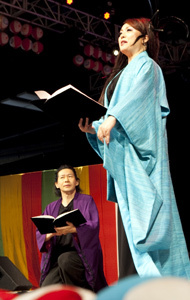 Keiko slowly entered the stage with a book in her hand while she sang the Japanese children’s song Toryanse. Also, the audience cheered as she appeared in a blue kimono which reminded of the Hawaiian sky. Afterwards, Man Nomura appeared on stage and slowly explained the story line of the play in Kyogen-style before it began. After the play, the lights were dimmed and the dancers called ”Dengaku Hoshi” appeared out of nowhere through the audience which created a stir. The audience looked puzzled as they looked around to see what had happened. After all the members went up on stage, the sound of the taiko drum got louder which the performance between the dancers of Japan and Honolulu was started. Originally, both Tenshu Monogatari and Daidengaku are longer than the short versions which were performed for the Honolulu Festival. They were impressive even though each of them only runs 30 minutes. There were non-Japanese speakers among the audience however, they looked fascinated from the beginning to the end. All the seats were full. 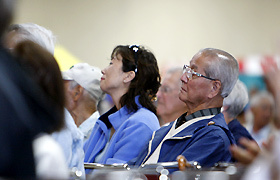 Some of the audience stood to watch the performance. Reader’s Theater is a style of theater in which the story is told and performed by reading a literature. 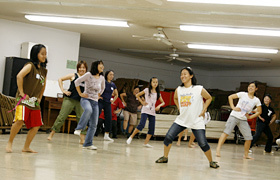 The dancers of Japan and Honolulu performed together for the first time. Each dancer in a colorful costume was holding a different type of instrument and performed their dances.